The Owl and the Pussycat went to sea, in a box on the living room floor. Any book that starts with a box is starting out well as far as I’m concerned, particularly as my own children are rather like cats if you leave a box unattended 😉 Tigerboy was a bit perturbed that it wasn’t about a *real* owl or cat, but he quickly got into the swing of it, and loved spotting all the items mentioned in the captions. In fact we had to read it over immediately as he was afraid he might have missed some details. It’s a gentle imaginative build on the poem (would fit in really nicely into a unit study on the poem, were I to ever get myself organised enough to do such things) and I really enjoyed it – definitely won a place on the shelf by the bed reserved for frequent bedtime reads. Also made me think that we could do with some Edward Lear as I don’t think we current have a dedicated volume, so that’s gone on my wishlist, does anyone have recommendations? Author Coral Rumble says: I have worked as a poet and performer for many years and I’m proud to have my work featured in Favourite Poets (Hodder). I have three published poetry collections of my own and have contributed to more than 150 anthologies. I am also one of the writers of the popular Cbeebies programmes ‘Poetry Pie’ and ‘The Rhyme Rocket’. I have given workshops in some fairly unusual venues as well…the grandest of which being Buckingham Palace! 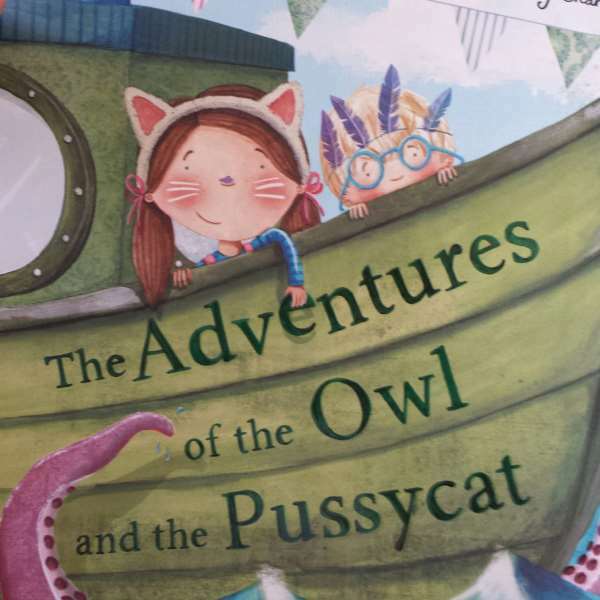 Illustrator Charlotte Cooke says: I was thrilled and proud when my picture book The Adventures of the Owl and the Pussycat was highly commended for the Macmillan Children’s Prize in 2010. Since then I have gone on to illustrate many other picture books and I enjoy making the occasional card too. When I’m not in my studio I’m usually outside running or playing referee to my two kids. The picture book The Adventures of the Owl and the Pussycat seems like a rewarding book. I will read it with my kids as soon as possible!